On Friday, June 1st Harley Avenue held its annual Kindergarten End of the Year Celebration. The Kindergarten boys and girls had been practicing their songs and poems for weeks in order to prepare for this celebration. Many family and friends came to watch and enjoy the presentation, and even shed a few tears as they watched their little ones get ready to move on to 1st grade. Thank you to the Kindergarten teachers and our music teacher, Mrs. Long for helping to make this a memorable day for so many! On Tuesday, May 15th Harley Avenue held its monthly assembly to honor three children as the new Knights of the Month. The Knights for the month of May are Andi Mustafaj for Kindergarten, Jake Williamson for First Grade, and Carissa Capalbo for Second Grade. Congratulations to Andi, Jake, and Carissa for being hard working, responsible, and kind. We are very proud of you all! On Friday, Harley Avenue celebrated our April Spirit Day by dressing up like Rock Stars! The children looked great in their shades, colored hair, and rock star clothes! Some brought blow up guitars, homemade guitars, and some microphones. Elvis was in the building! During lunch Ms. Millie entertained the children with her Superstar Rock show in the cafetorium. What a fun day we all had! On April 25th Harley Avenue held it's monthly assembly to induct three new members into the Harley Avenue Knights of the Month. This month's honorees are Leonardo Coca for Kindergarten, Maria Giamos for First Grade, and Colin Maggiore for Second Grade. Congratulations Leo, Maria, and Colin on being polite, hard working, kind, and respectful students! We are so proud of you all! On Tuesday, April 24th Harley Avenue got a surprise from a very special visitor. Quacker Jack from the Long Island Ducks baseball team came to greet the students at dismissal! There were plenty of smiles, hugs and high-fives as the children said hello to Quacker Jack on the way to their buses. Quacker Jack is at every home L.I. Ducks game so try to take in a game this summer if you can! On Friday, April 20th the Harley Avenue 2nd Graders performed in their Earth Day Concert. They sang songs and played instruments to teach about ways to make our Earth a better, safer, and cleaner planet. Many family and friends came to watch the children perform their last concert in Harley Avenue. It was a wonderful event! Congratulations to the 2nd Grade, and to Mrs. Long, our music director on another outstanding concert! On March 23rd and 26th the second grade classes presented their annual Poetry Slam! Family members came to watch each child recite a self-authored poem. It was a very "hip" event with audience members giving some finger snaps instead of the usual applause. The children did a great job and it was another fun, innovative day at Harley Avenue! On Monday, March 26th Harley's monthly Knight assembly took place. Three new Knights were selected to represent Harley for the month of March. Our new Knights are Ella Keegan for Kindergarten, Ava Frank for First Grade and Kayla Winters for Second Grade. We are so proud of our new Knights for being helpful, kind and responsible. What great role models they are for their peers! Congratuations Ella, Ava, and Kayla! On Friday, March 2nd Harley held it's monthly Spirit Day. This month's theme was "Book Character Day". The children had the option of dressing up as their favorite book character! There were so many great and creative costumes. Harry Potter could been seen talking to Strega Nona! Mary Poppins waved hello to Pete the Cat! Fly Guy was walking down the hall with Alice in Wonderland! What a wonderful and fun day at Harley! On Friday February 16 Harley Avenue held it's monthly assembly to honor three new Knights! The children who are representing our school for the month of February are Jack Antico for Kindergarten, Peyton Kleczka for First Grade, and Julianna Barragato for Second Grade. Jack, Peyton, and Julianna are wonderful students who have proven themselves to be polite, helpful, respectful and responsible. We are so happy to honor these terrific children! On Monday, February 12th the students at Harley Avenue celebrated the 100th day of school by dressing like they were one hundred years old. The children did an amazing job dressing up and many of the "elderly" could be seen walking with walkers, canes, glasses and an abundance of gray hair! What a fun day we all had. Happy 100th Day of School! On January 29th, we held an assembly to honor three new Knights for the month of January. The new honorees are Adahan Ankay for Kindergarten, Meghan Freifeld for First Grade, and Marcus King for Second Grade. We are so very proud of our new Knights for showing politeness, helpfulness, kindness and respectfulness - all attributes of a Knight! Congratulations! On January 9th, the students at Harley Avenue were treated to a fun and exciting presentation called "Brain Challenge". Students were picked randomly to come up to the stage and answer questions, compete in a physical challenge or do a spelling challenge. There was a tug-of-war and dance competition too. Even the teachers were able to participate in the trivia and tug-of-war events! The children and staff had a great time! Thank you to Hollyrock Entertainment, Inc. for bringing us this fun, educational and entertaining presentation! On Wednesday, December 6th Harley Avenue was treated to a visit by Author Richard Torrey! Mr. Torrey spoke to the students about how he became a writer and illustrator and demonstrated how he draws his characters. He spoke about how he illustrates books for other authors, and how his own books are now available in eight different countries! Afterward, he went to the library where children got autographed books that they purchased earlier. What a wonderful experience for our children! On Friday, December 15th the 2nd Graders put on a wonderful Holiday Concert for their family and friends. They sang songs about all the different holidays in December and some students even performed using rhythm sticks, sleigh bells, drums, and bells. Even Frosty the Snowman was there! The children did an outstanding job and it was a great way to get everyone in the holiday spirit! Congratulations to Mrs. Long, our music teacher, and to all the talented 2nd grade students on a job well done! On Monday, December 11th Harley held it's monthly assembly to induct three new Knights of the Month for December. December's Knights are Victoria Agrawal for Kindergarten, Ethan Mohabir for First Grade, and Milaan Gandhi for Second Grade. ​​. Victoria, Ethan and Milaan have proven themselves to be kind, polite, respectful and hard working - all great qualities that define our Knights! Congratulations! On Monday, November 20th, there was a monthly assembly at Harley Avenue to proclaim three new Knights of the Month. The new Knights are Matthew Dunphy for Kindergarten, Danika Jhaveri for First Grade, and Maelin Savarese-Seluzitsky for Second Grade. Congratulations to our new Knights for demonstrating qualities that exemplify what it takes to be a Harley Knight! We are proud of you Matthew, Danika, and Maelin! On Friday, November 17th the Kindergartners held their annual Thanksgiving celebration. First, they performed a concert for their family and friends. Afterward, the families were invited back to the classrooms where the children (dressed in Native American and Pilgrim outfits) shared a Thanksgiving snack. The Kindergartners did a fabulous job at their concert and looked amazing! Thank you to Mrs. Long and the Kindergarten teachers for all their hard work. On Thursday, November 16th Harley Avenue held an assembly to introduce the students to our new initiative called Positive Behavior Intervention Support (PBIS). Students are rewarded for positive behavior with stickers and cards that they can add to the Harley Knight scroll for all to see! We are using three consistent school expectations known as the 3Rs: Respect, Responsibility and Relationships. We believe this will support a school community where ALL students CAN succeed both academically and socially. On Tuesday, October 31st Harley Avenue celebrated Halloween by starting our day with a wonderful parade. Lots of families came to watch the children as the circled the parking lot to the sounds of the Elwood Middle School band. Afterward, the children enjoyed a beautiful day outside at the Harvest Festival where they fished for apples, stuffed scarecrows, tossed bean bags and picked pumpkins in the pumpkin patch. There were many wonderful costumes including our Kindergarten teachers as Smurfs, our First Grade teachers as Minions and our Second Grade teachers as Super Heroes! What a wonderful day! 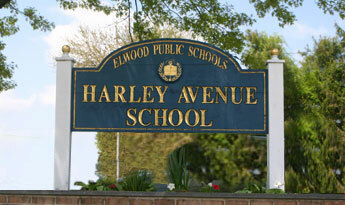 On Friday, October 27th Harley Avenue held it's monthly Pep Rally. During this assembly three children were selected as the new Knights of the Month for October. The honorees were Paige Borg for Kindergarten, Michaela Grever for First Grade and David Velasquez for Second grade. Paige, Michaela and David have proven themselves to be polite, helpful and responsible- all qualities we look for in our Knights! Each of the children had family members present to share in their achievement! We are so proud of our October Knights! On Monday, September 25th Harley Avenue held it's monthly assembly in which three children were chosen to be Knights of the Month for September. The new Knights are Cayla Capalbo for First Grade, Nicholas Augustine for First Grade and Bryan Robin for Second Grade. These three students have started off the new school year by being responsible, polite, helpful and respectful. What a great way to start the school year! We are very proud of Cayla, Nicholas and Bryan! The first day of school began on September 5th. There were many smiles and a few tears, but all in all it was a great day. Children and staff showed up ready to learn, teach and begin another exciting year at Harley Avenue!